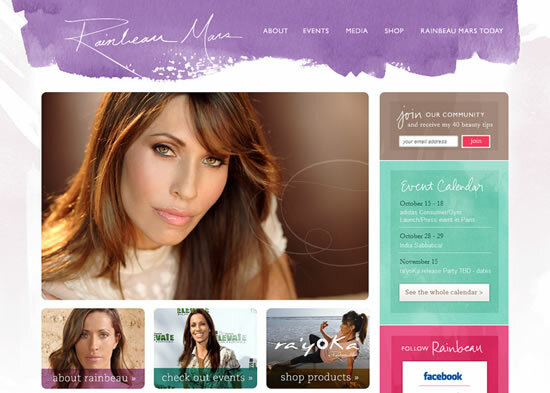 What I love about this design for Rainbeau Mars is the pastel colour scheme which is driven by the purple, watercolour paint effect of the header. The watercolour splash is in contrast to rest of the page which is comprised of carefully arranged content, with some rounded corners, and a large slideshow image that dominates the page. I also like the semi-transparent captions on the smaller images. Art in My Coffee is a beautiful mixture of brown, coffee-related colours, together with some subtle line shadow/depth effects. I also like the rounded corner borders, and their bottom arrow, for the images. The main content is organised into a three-column grid which really suits the website’s purpose. The logo has a cool hover effect as well. I love this design! And there are some great examples of coffee art featured! These are two outstanding examples of web 2.0 designs that encompass a great choice of colour schemes and features. 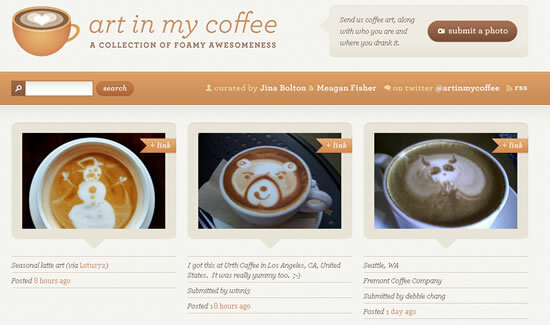 Of the two I particularly like ‘Art In My Coffee’, with its subtle usage of browns and imagery. I like the usage of rounded corners in both the websites, as I think this works well in any design style. Incorporating a search feature is a nice addition to the design too. Both these designs are examples of how incorporating the correct colour schemes and images can result in beautiful and effective layouts.